How much water is used in shale gas production? Where does the water for shale gas production come from? How is a well constructed in order to protect groundwater? How is wastewater handled and treated? How to monitor groundwater quality? Groundwater is one of the most vital resources for life. The availability of groundwater in sufficient quantities and quality is pivotal for drinking water supply, agriculture, industrial processes and energy production in many regions of the world. Groundwater issues related to shale gas are 1) potential competing water usages in arid areas and 2) the risk of groundwater contamination by fracturing fluids or methane. Possible contamination pathways and risks, as well as precautionary measures, are described below. 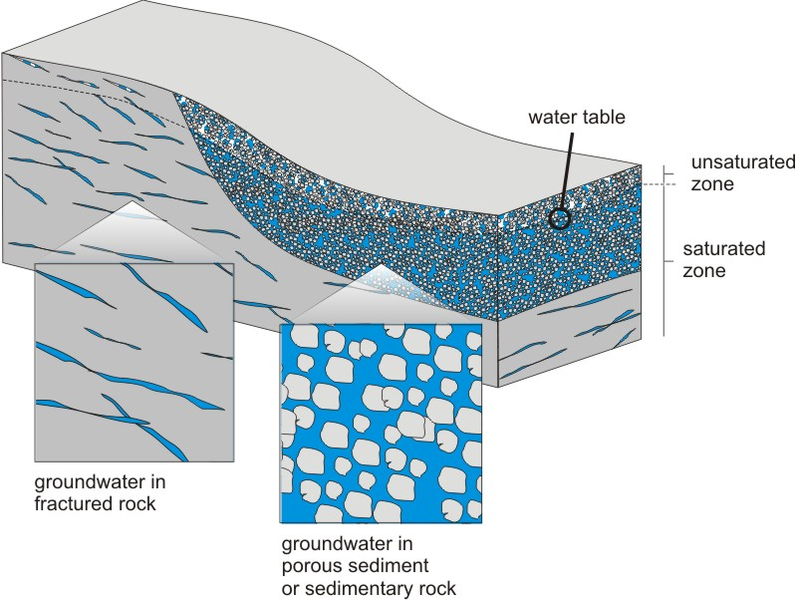 Groundwater is present in tiny pores and fractures in the rocks. Groundwater comprises water found beneath the earth’s surface. It is one of the most important natural resources and vital for human beings, animals and plants. Shallow groundwater, found in soil and rocks lying tens to hundreds of meters below the surface, is often fresh water that has low concentrations of dissolved salts and other total dissolved solids. Deep groundwater is usually saline. Nearly 70 % of the surface of the Earth is covered with water. 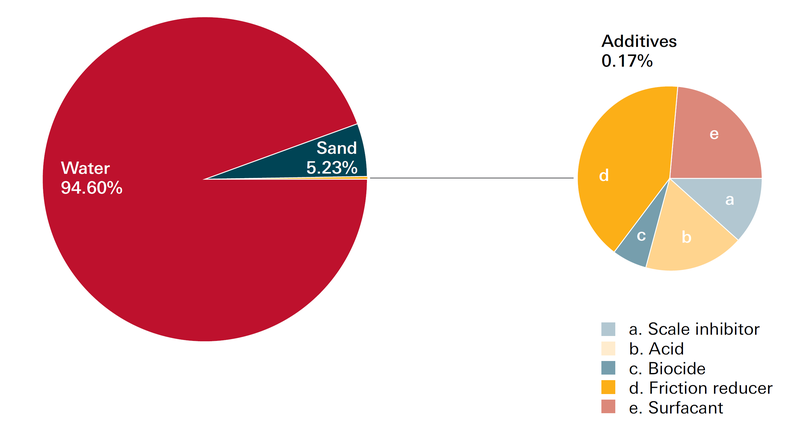 However, the majority of this contains salt and a mere 2.5 % of the global water resources is freshwater. Of these freshwater reserves, almost 70 % is stored in the form of snow and ice, approx. 30 % forms our underground freshwater reserves and less than 0.5 % is surface water in rivers, lakes and wetlands. Most groundwater resources have accumulated over many centuries - or even millennia. Groundwater availability varies greatly from region to region. Climatic conditions determine how much the groundwater is recharged. The volume of water that can be stored is controlled by the reservoir characteristics of the subsurface rocks. Agriculture is the greatest single worldwide consumer of water (70 %), followed by industry (20 %) and homes (10 %). However, the biggest consumer of water in Europe is the industry (approx. 50 %), followed by agriculture (30 %) and households (20 %) (UNESCO 2012, WWDR4). The demand for clean water increases continually in line with world population growth. In many areas most drinking water comes from groundwater - up to 80 % in Europe, and even more in North Africa and the Middle East. The need to ensure water provision for both human use and ecosystems is becoming a priority within the field of water management. Energy and water are intricately connected. Although there exist different sources of energy and electricity, all require water for various production processes, including extraction of raw materials, cooling in thermal processes, cleaning materials, cultivation of crops for biofuels, and powering turbines. Conversely, energy is required to make water resources available for human use and consumption through pumping, transportation, treatment, desalination and irrigation. This double-sided interdependency of both resources has been coined the water-energy nexus, and introduces key cross-sectoral vulnerabilities (UNESCO 2012, WWDR4). More general information on groundwater can be found on the UK Groundwater Forum website. Drilling and fracturing a typical horizontal shale gas well requires roughly 10 Mill to 30 Mill liters of water (10,000 to 30,000 m3). How much is that? 20,000 m3 of water is equivalent to 8 x the volume of an Olympic-size swimming pool (25 x 50 x 2 m). The amount of water needed depends on the length of the well, the number of fracturing operations per well and the properties of the target rock formation. While some amount of water is needed for drilling operations, the majority of water in shale gas production is used during the process of hydraulic fracturing.While the water volume required for shale gas production is no trivial amount, it is a small percentage of the total water consumed by other sectors. Data for 4 major U.S. shale plays show that shale gas production comprises only a small fraction of water use (Tab. 1). Tab. 1: Water use by sectors in four major U.S. shale plays (ALL Consulting, 2009). Numbers in %. An alternative approach to measuring water consumption is to compare the water intensities of different energy resources, featuring amounts of water used per energy unit produced (Mielke et al., 2010). 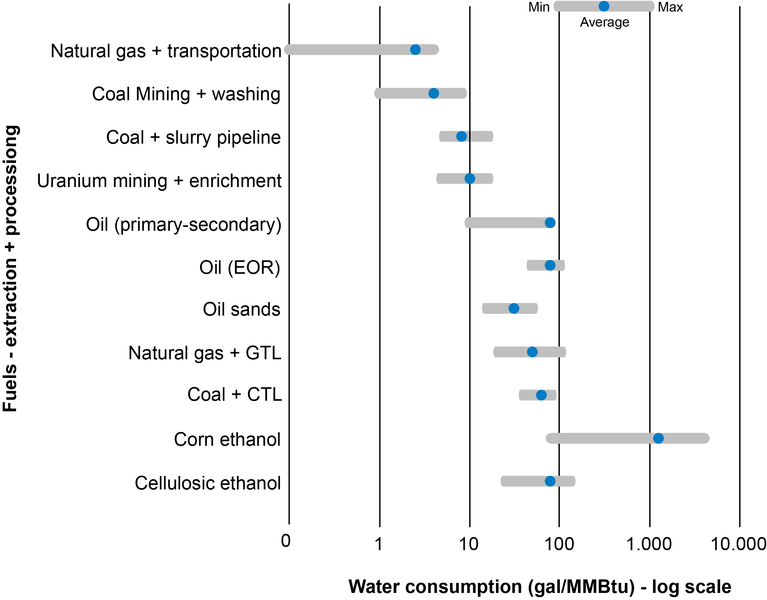 This shows that shale gas production has a higher level of water consumption than conventional natural gas (Fig.1), but lower water consumption than other fossil fuels, like coal or oil, and significantly less than biofuels (Fig. 2, note different scale on x-axis). Fig. 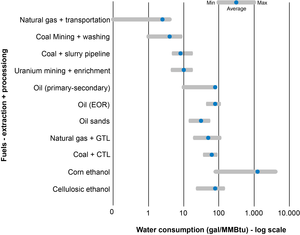 1: Water consumption during natural gas extraction and transportation (Mielke et al., 2010). The water used for drilling and hydraulic fracturing can be obtained directly from ground or surface water systems. Other sources are municipal water suppliers, recycled water from municipal treatment facilities or industry (e.g. power plant cooling water), as well as recycled shale gas flowback water. Large water withdrawals from surface or groundwater supplies can have significant ecological effects if not done carefully. They could also affect nearby drinking water sources and other uses of the resource. This increases the potential for conflicts between water users and uses. Operators should work closely with local and regional water management agencies to become aware of competing water requirements and constraints in water availability. Casing strings (steel tubes) are important elements of well completion, with respect to the protection of groundwater resources, because they ensure the isolation of groundwater from the inside of the well. A well is completed in a telescopic fashion with a smaller diameter of casing installed and cemented inside larger diameter and shallower well sections. The first large diameter casing, the conductor pipe, is constructed as a support for both the well head equipment and the set of valves that block the high pressure fluids from the well (the Blow-Out Preventer or BOP). Normally a surface casing is then run and cemented in order to protect the fresh water aquifers in the area. Other intermediate sections are added if needed, mostly to ensure that high pressure fluids, which are encountered as the well is drilled deeper, do not crack shallower, weaker rocks. Finally, a production string is run to the target formation. Some sections of steel pipe do not go up to surface but are hung inside the previous casing. Normal carbon steel is used and the thickness will depend on the pressure rating required (usually in the range of 7-20 mm). There are different grades of steel, with increasing yield strength, and alternative metallurgies can be used in corrosive environments (e.g. high chromium stainless steel). Cement is even more variable: Its base material is still Portland cement, similar to that used in construction, but it is mixed with a large number of other materials to obtain slurries less dense than water or more than 2.5 times its density, depending on the pressure of the formation fluids and the resistance of the rock. Fluids used for hydraulic fracturing purposes are called fracking fluids or fracturing fluids. They are injected into drilled boreholes under high pressure, in order to create targeted fractures and fissures in gas-bearing bedrock. After the fracturing operation, the fracturing fluid in the wellbore has to be removed, so that natural gas can be produced from the well. The fluid is removed simply by decreasing the pressure in the wellbore after the hydraulic fractures have been produced. During this flowback-phase, part of the fluid flows back to the surface where it is collected, treated, disposed of or re-used. Only a fraction of the fracturing fluid flows back to the surface; a considerable amount of the originally introduced volume remains underground. So-called “slickwater” fracturing fluids are commonly used in shale gas hydraulic fracturing operations. They are water-based and include proppants and chemical additives. The term´slickwater´ infers that the water has lower viscosity than regular water, to reduce friction loss in the pipe while injecting the fluid. This is accomplished by adding friction-reducer to the fluid. Slickwater fracturing fluids usually contain 98-99 vol% of water, and include 1-1.9 vol% of proppants and typically less than 1 vol% of additives (King, 2012). Proppants, small grains of sand or ceramics, settle in the created fractures. When the pressure is released at the end of the fracturing operation, proppants keep the tiny fractures open, and thus ensure increased gas flow from the shale to the wellbore. Various chemical additives support the success of the fracturing operation. For fracturing operations in a single well, 10,000 to 25,000 m3 of water are required (Broomfield, 2012). The numbers and volume of additives used may differ from one shale play to another, depending on the properties and the depth of the target shale, among other things. Therefore, a large variety of fracturing fluid additives exists (Tab.1). Tab. 1: An overview of common additive classes, their purpose and some examples. However, only a small number are used when it comes to the fracturing of a specific shale gas well. 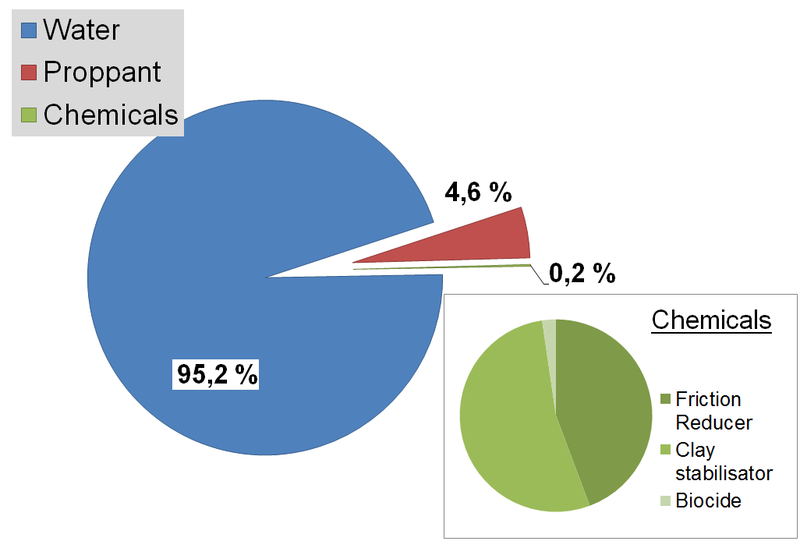 A general example of potential additives and their amounts is displayed in Fig. 1. Concrete fluid compositions may differ significantly, however, see Fig. 2. Fig. 1: Generalized example of fracturing fluid composition for shale fracturing. Additives such as friction reducers and biocide are frequently used, the other additives shown are used in far fewer operations, depending on the shale properties (King, 2012). Source: Shale gas extraction in the UK: a review of hydraulic fracturing (2012). Fig. 2: Fracturing fluid compositions for shale fracturing. Left: ExxonMobil Germany, fluid used in 2008 (“Damme 3”); Right: Cuadrilla, UK, fluid used in 2011. Wastewater from shale gas production falls into two categories: The fluid that is recovered from the well shortly after hydrofracturing (within ~30 days) is called flowback water. Produced waters surface with the natural gas once the well is in production. While produced waters surface in small quantities over the lifetime of the well, the large volumes of flowback water with complex compositions that emerge from the well over a shorter timeframe pose particular challenges. Flowback water must be treated before reuse or disposal (unless injected into deep disposal wells). Treatment may include simple evaporation to reduce the volume of wastewater, filtering or chemical precipitation of substances. Dilution involves blending flowback water with freshwater to make it usable for future fracturing operations. Deep disposal wells may be used for the final disposal of wastewater, if they are available. Technologies for treatment, reuse, transportation and disposal are continually evolving, and not all technologies are suitable for every shale gas play. Here you can read a good overview on Current and Emerging Treatment and Disposal Technologies in the U.S. Marcellus Shale area, including the volume and chemistry of generated wastewater and a discussion of options for flowback water treatment and management. Read more about shale gas water management and flowback water treatment options on SHIP here. Groundwater quality monitoring in shale gas plays is straightforward and comparable to groundwater monitoring in other settings. Groundwater monitoring should be based on a monitoring concept that includes an understanding of the groundwater flow regime, identifies the relevant water parameters to be determined and describes measuring/sampling frequency. It must take into account all potential contamination pathways. Measurements and water sampling can be conducted in wells which are already present or are specifically drilled for monitoring purposes. Natural springs and rivers may also be monitored. The most important factor in the interpretation of groundwater analytical results are groundwater quality baseline surveys which must be conducted before operations start. This helps to separate the possible impacts of shale gas operations on groundwater quality from other effects. Enhanced concentrations of natural gas in groundwater, for example, might possibly originate from shale gas operations, but in some regions it is already present in substantial concentrations in groundwater as a natural feature.